We had arrived in France at dusk, and made our way to the aire in Montreuil. We don’t normally drive in the dark and the combination of mostly unlit roads with the moving lights of the wind turbines made for a strangely eerie journey. We were glad to get to the busy aire and negotiate into a spot in the overflow parking area. On waking the following morning everything seemed much more normal. The aire was packed with French vans, their occupants stopping to chat to each other as they made their way into town or to the service point. We exchanged a bonjour or two as we popped out for a stroll around the towns walls before heading into the main square to set ourselves up with some cash. 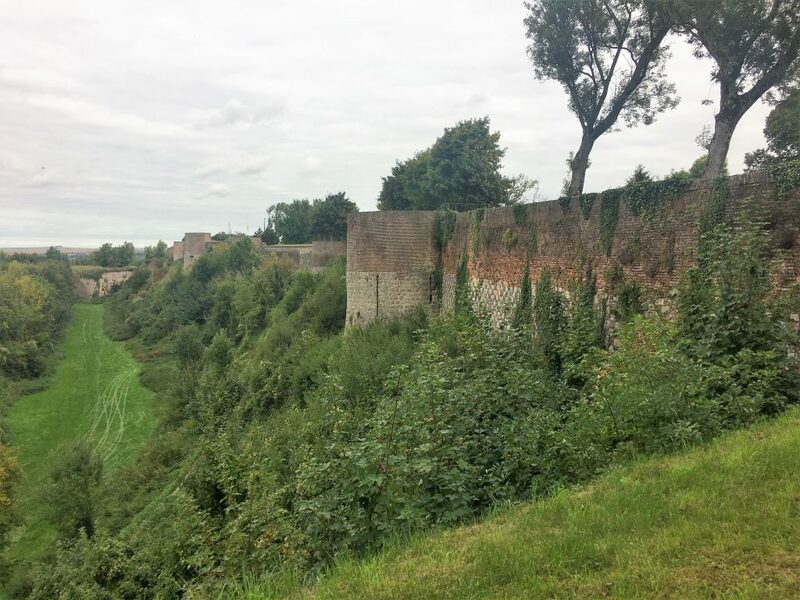 As well as the impressively high town walls (very wide but with no railings to stop you from falling into the allotments below) built after an attack by the Hapsburgs, the town was the British GHQ in the first world war. After stretching our legs we returned to the van and moved on. 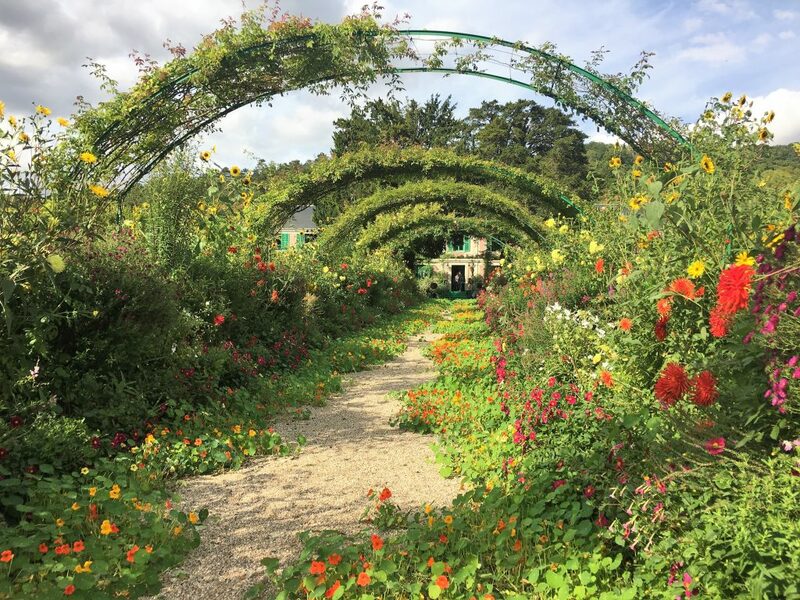 Our destination was Giverny, a small town that now is a busy tourist attraction, being the location of Monet’s house and gardens and a museum of impressionism. Our aim was to get here in early afternoon so that we could visit Monet’s gardens before they closed at 6. We had no desire to battle the Saturday morning crowds, and a tip from Trip Advisor had suggested that a late afternoon visit would be far less crowded than an early start. The tip seemed to be accurate. When we arrived just before 4 there was only one coach in the car park, when we opened our curtains the following morning there were already half a dozen coaches parked up and more were arriving. Monet moved to Giverny in 1883 when he was in his 40s. Initially he rented the house and lands. As he started to sell more paintings he amassed enough wealth to buy the house, lands and additional water meadows on the other side of the main road. He spent a lot of time on the gardens, becoming a keen gardener (with help of course). The gardens have an English cottage garden feel with packed borders surrounding grassy lawns. Although they are small they are exuberantly vibrant with colour. Dahlias, arranged according to their colour, were the star of our visit and the long nasturtium tunnel was a stunning focal point even if it had suffered from the hot dry weather. These underrated flowers trailed across the paths and up the arched supports in a riot of fiery tones and green leaf. To get to the water meadows, the famous Japanese bridge and the lake of water lilies you have to use a tunnel under the road. This area had a peaceful atmosphere despite being busy. You can see why Monet painted the scene here many times with so many perspectives. The light shines through the leaves of the willows and the tall bamboo creating dappled reflections on the water. Huge carp swim lazily in the lake between white and pink lilies. 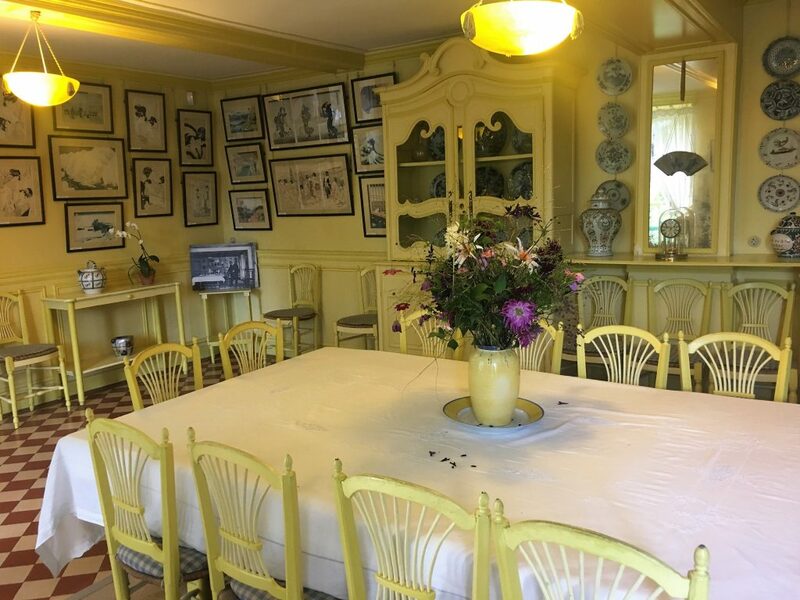 Monet’s house has been restored with the help of photographs from the time when Monet lived there. His studio walls are covered with reproductions of his paintings and the other walls of the house hold his large collection of Japanese prints. His bedroom has large windows that provide fantastic views over the garden, a comfortable space that would be difficult to leave. However the two tone yellow dining room, followed by the busily blue kitchen was a bit much for my eyes. The yellow dining room may have put me off my dinner! 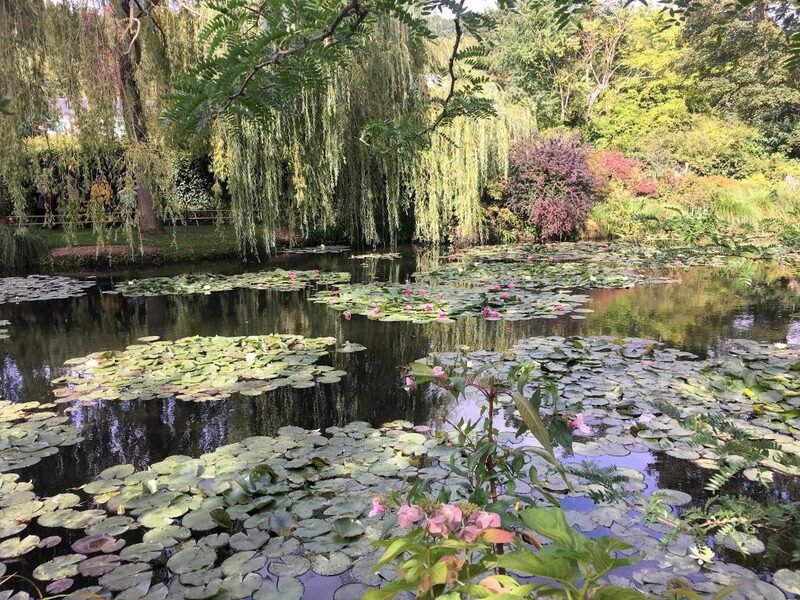 The cost of visiting Monet’s house and gardens is under 10 euros each and two or three hours is enough time to take it all in. It’s a shame that you cant wander all of the paths through the gardens, but with the volume of visitors you can understand why some areas are restricted. For motorhomers the bonus is a large free car park (no services) where a 24 hour stay is permitted. My own garden would never have been a patch on this – but oh how I miss it!